This beloved classic movie has many fans, including one very evil person. 1. Walt Disney came up with the idea to do a retelling of Snow White and the Seven Dwarfs when he was 15. The 15-year-old Walt was inspired to do it after seeing a silent film version of Snow White in his hometown of Kansas City. 2. The 1934, Silly Symphony cartoon called The Goddess of Spring, was made primarily as a test reel to see if the animators could create a convincing female human character. 3. Originally the movie was budgeted at $250,000, but after production ran over it ballooned to $1.5 million–an enormous sum in the 1930’s. Walt was forced to mortgage his home to pay for production. 4. Lillian Disney, Walt's wife, thought the movie would bomb. 5. It took almost two years to come up with the final renderings of the Seven Dwarfs. 6. Rejected names for the dwarf’s included: Jaunty, Blabby, Dirty, Gabby, Biggy-Wiggy, Gaspy, Gloomy, Awful, Deefy, Hoppy-Jumpy, Hotsy, Nifty, and Shifty. 7. 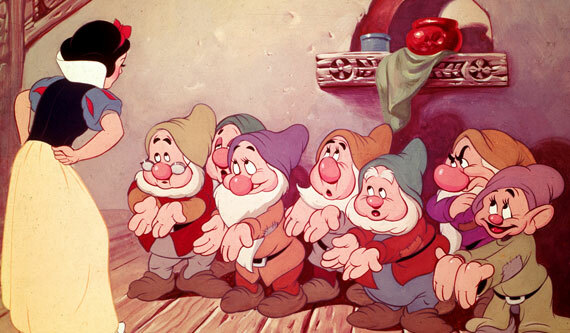 Six of the dwarfs have eyebrows modeled after Walt Disney’s. Happy was the exception, his eyebrows were white and bushy. 8. Legendary voice actor Mel Blanc, best known as the voice of Bugs Bunny, was originally cast to be the voice of Dopey, but he was made mute instead. 9. 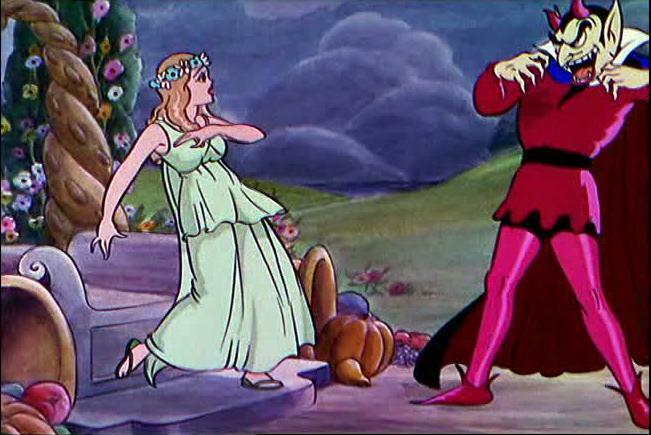 Lucille La Verne, the voice of the Wicked Queen, was able to achieve the raspy Old Hag’s voice by removing her dentures. 10. If you watch closely, you will notice that after Snow White is awakened by the Prince's kiss, she kisses six of the Dwarfs goodbye, she does not kiss Sleepy. 11. The Prince was intended to be a prominent character, but the difficulty found in animating him forced Walt to reduce his part significantly. 12. 19-year-old Adriana Caselotti voiced Snow White. Walt wanted to keep Snow White's voice special, so he held Adriana to a very strict contract and she was never allowed to perform on stage or film again. 13. But, Adriana did sneak in another - uncredited - voice over in "The Wizard Of Oz", in the scene where the Tin Man sings "If I only Had A Heart", she is the voice that says "Wherefore art thou, Romeo?" 14. Songwriters Frank Churchill and Larry Morey composed 25 songs for the movie, though only seven were used. 15. Snow White and the Seven Dwarfs was the first film to ever release a motion-picture soundtrack. 16. A short film sequel, titled Snow White Returns was planned. It never left the preproduction stage and no reason is known why Walt decided against making it. 17. After the film's run at New York City's Radio City Music Hall, many of the velvet seat upholstery had to be replaced. Young children were so frightened by the sequences in the movie that they wet their pants, and consequently the seats. 18. Snow White was the highest grossing film ever for exactly one year, it was surpassed by Gone with the Wind. 20. The profits from Snow White and the Seven Dwarfs allowed Walt to build Disney Studios in Burbank.